The lovely little church of St Catherine is nearly 2 miles up the valley from St John’s, but is well worth a visit. Though it stands in the private grounds of St Catherine’s Court, it is always open to visitors during the day. 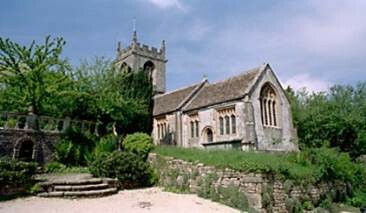 The church is tiny, seating 50 at the very most, and was built as a retreat for the monks of Bath. The nave and tower date from the thirteenth century, while the chancel was rebuilt by Prior Cantlow in 1490. The joys of St Catherine’s however are the embellishments provided by several generations of the families who have lived at the Court, including the seventeenth- century Blanchard family tomb. The windows in the chancel contain medieval glass. A further renovation in the 1840s by the Strutt family resulted in some flamboyant Victorian wall tiles, and there are monuments in the nave to members of the Strutt family who died in the two World Wars. Click here to see Service Times and meeting information for St Catherine's.